Works perfectly with an easy-to-use interface. Good software: lots of useful features, stable and nice GUI. I used portable and installable versions without experiencing any kind of troubles. Spread OpenCandy ! Avoid ! Last version seems more responsive than older ones I used, maybe it is faster because it is compiled for 64 bit Windows, feature set is complete, and it is free. Gave it a 1 because it wants to install the candy garbage for windows. Have used this for several years now. Best archiver in my opinion, since it uses components from many other open source projects, e.g. 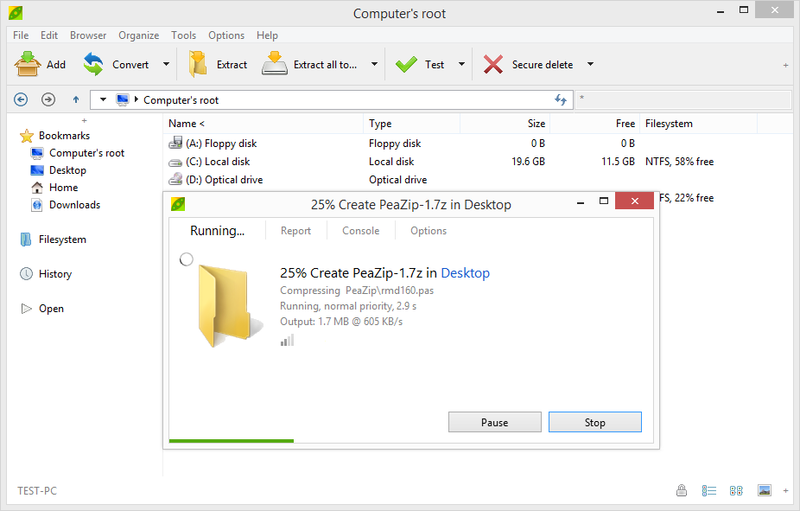 7-zip and FreeArc. It handles all formats I need, plus the obsolete .RAR format. There's a "plain" version available for download on sourceforge.net without the bundled crapware. Currently my favorite. Its come a long way over the years and now offers more features and functions than it used to. if you want a free zip program you won't go far wrong with this gem. Speed greatly improved over previous release, and the new duplicate finder is very useful. @asaenz I've tried secure delete with a couple of undelete software and all seems working fine, no data was recoverable after secure deletion (W7 64 bit). Would use the secure file deletion if I thought it was working properly. Tried secure deletion of a 800,000 KB file that takes about 12 seconds to copy and it supposedly wrote random data to it 8 times and renamed it with random name in about a second ... I don't think so. Installed 64 bit version on Windows 7 system. Very good free archive program. It supports a lot of file formats, and has much better support for encryption than most programs do. Even with 7zip files it creates, you can use a .key file along with the password, something you can't do with 7zip itself. This is an excellent and free software. But, don't download it from here, as the file here is not the full program. I think it is stupid for this site not to provide the full installer which is only about 6 MB in size.